Oscar frontrunner The King's Speech may be subject to additional edits in hopes of obtaining a PG-13 rating and widening its potential audience. If you haven't seen The King's Speech, first, you're missing out. Second, you may not know why the film is rated R in the United States, which requires anyone under the age of 17 to see the film with a parent or guardian. I'll try to fill you in without spoiling anything: The film features the F-word over a dozen times, in a context that has little to do with the word itself. The scene is beautifully filmed and masterfully acted, but executive producer Harvey Weinstein wants to trim it a bit to appease the Motion Picture Association of America ratings board. Weinstein is talking to the film's director, Tom Hooper, about how they can reach a compromise for a PG-13 rating. In Britain, The King's Speech has a rating which allows those 12 and over to view it, and the film is doing quite well as a result. Weinstein told The L.A. Times, "The British numbers are huge because the rating lets families see the movie together. Tom and I are trying to find a unique way to do this that keeps his vision of the movie." 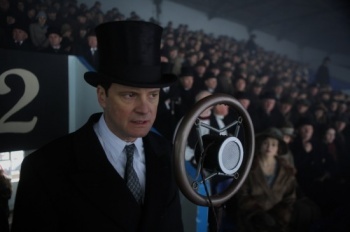 The King's Speech was nominated for 12 Academy Awards, including Best Picture. The campaign for a new rating exists independently of the awards: The Oscars will be broadcast on February 27, but the proposed edit would be unlikely to hit theaters before that date. Weinstein is also looking to change up the marketing campaign for the film to draw in more viewers. Here, Harvey, I'll try to help: The King's Speech is incredible. I highly recommend it.